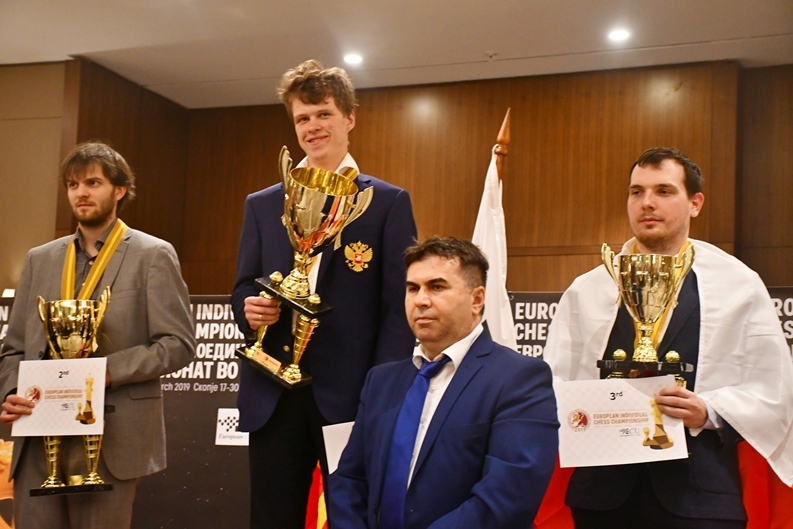 Vladislav Artemiev’s fantastic year continued as the 21-year-old Russian added the European title to victory in Gibraltar and double gold at the World Team Championship. In the final round he held a tricky position against Maxim Rodshtein, who would have taken gold with a win but had to settle for 4th place. Sweden’s Nils Grandelius matched Artemiev’s 8.5/11 but took silver on the tiebreak of having lower-rated opponents, while Poland’s Kacper Piorun won bronze. The top 26 players are all qualified for the World Cup later this year. 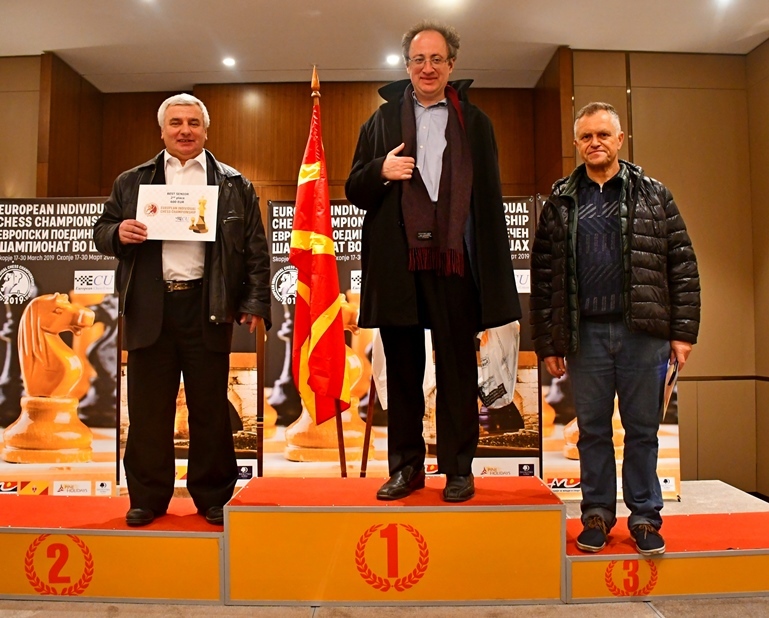 We’ve been talking about Vladislav Artemiev for a while now – for instance in our last report from Skopje, Artemiev overtakes Kramnik – and there’s little more to add! 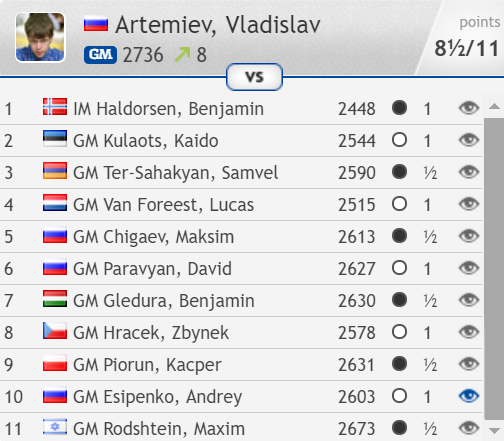 The Russian grandmaster is suddenly playing at a stable 2800 level that has taken him to world no. 14, and he made justifying his status as top seed to win the European Championship look easy. He scored his fifth win in five with the white pieces by beating 17-year-old compatriot Andrey Esipenko in the penultimate round. With White it looks as though, like a certain Magnus Carlsen, he’s happy merely to “get a game”, but when Ivan Sokolov suggested that to him Artemiev pointed out that he was actually well-prepared in his offbeat systems… something else that applied to the young Magnus (of course by now Magnus is well-prepared everywhere). The silver medal went to Nils Grandelius, who was the only player to win on the top 7 boards after his opponent Benjamin Gledura went for an unsound sacrifice in what was already a difficult position. 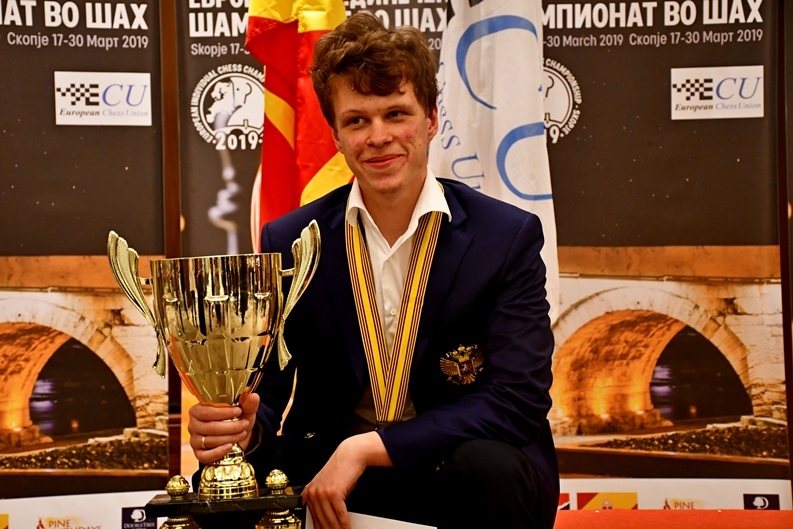 Kacper Piorun faced the toughest opposition of any player in Skopje, and since that was the first tiebreak he would have taken gold if he’d beaten Liviu-Dieter Nisipeanu in the final round, but a 17-move draw, his 5th draw in a row, gave him bronze. 35…Rxg2+! 36.Kxg2 Rg6+ 37.Kh1 Qxf2 There were still some more twists in that game, but it was a fine win for one of our chess24 video series authors. The computer spots the win 42…Qb2+! 43.Kh3 Ng4!, threatening Nf2+ and Nxe3. After 43.Bxg4 hxg4+ 44.Kxg4 Black wins the rook with 44…Qe2+, while 44.Kh4 Rc6! will soon be mate. After 42…Rc2+ in the game Erdos was still much better, but remarkably when the players eventually reached an ending on move 54 it was only level despite Black being two pawns up. One mistake was then all it took for Dubov to actually win, finish 23rd and qualify. That was financially costly, but in the end only meant the difference between finishing in 5th or 12th place. 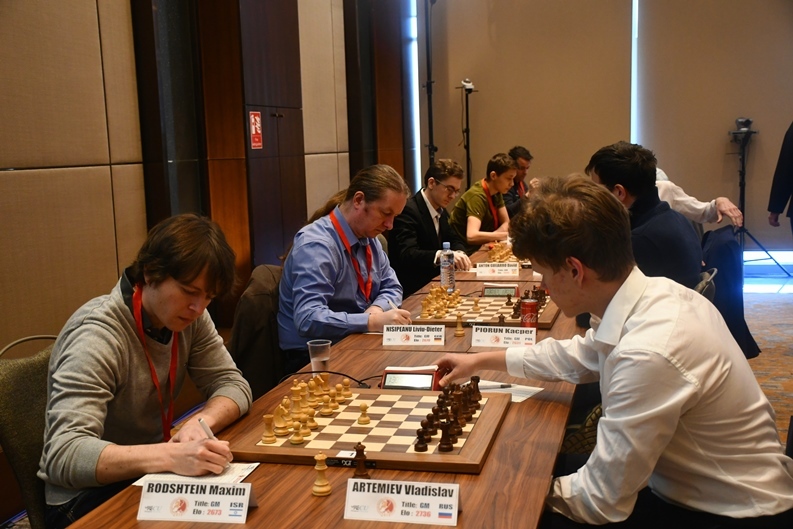 It had been a wonderful unbeaten tournament for the 110th seed, who performed at 2712, gained 27 rating points and of course qualified for the World Cup. For the curious here’s that game, where the final position is 0.00 according to the computers. Gelfand put his falling asleep at the board down to jetlag rather than any overindulgence in the local rice wine. So that’s all for the 2019 European Individual Championship! For those interested in the World Cup, the 128-player knockout that will take place in Khanty-Mansiysk from 9th September to 2nd October this year, you can find a good regularly updated qualification list here.